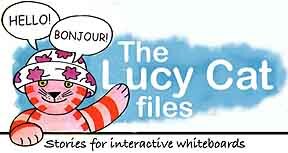 With the Lucy Cat files on CD-ROM, the whole class can join in the story. Touch any speech bubble or text on the screen to hear it in French. 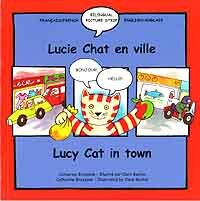 The CD-ROM also has 25 pages of easy-to-use fun activities using the language and vocabulary of the story. 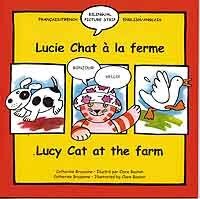 This movie extract from "Lucy Cat at the Farm" follows a teacher playing the story to her class on her whiteboard. 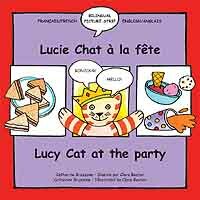 It's simple language, with plot and drama to keep children interested, as well as excited that "they can really read and understand French"! 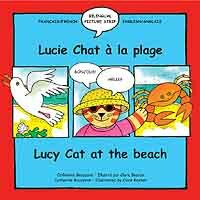 These NEW CD-ROMs feature Lucy Cat in stories with sound, that you can share and read along with the whole class. 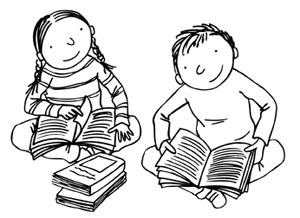 In the books, each page has the cartoon story in both languages: French and English. Each story is followed by over 25 slides of interactive whiteboard activities which give pupils the opportunity to practice the key language of the story. The CD-ROM has comprehensive teacher's notes you can print out; these give guidance on a slide by slide basis on how to best exploit the activities. (2) a Smartboard interactive whiteboard running Smartboard 9.5 software or later. NOTE: to run the files on your computer , it needs the IWB software - but it is possible to obtain the IWB software even if you don't have a board; see our HELP FAQ here.